Learn how students are tackling pressing social challenges! 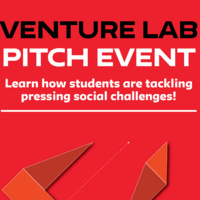 During this public event hosted by the Impact Entrepreneurship Initiative (IEI), top-performing teams enrolled in this spring’s Venture Lab course will share their innovative approaches to complex issues in domestic and global contexts. Join us to hear what students have learned as they pitch for up to $20,000 in prize money! Audience members will have an opportunity to share constructive feedback with teams, meet members of the broader New York City-based impact entrepreneurship community, and hear an inspiring keynote from Shaun Johnson, co-founder of Startup Institute. Light refreshments will be served following an announcement of the prize winners. Presented by the Impact Entrepreneurship Initiative at The New School.